Here is my yet another fried fish variety. 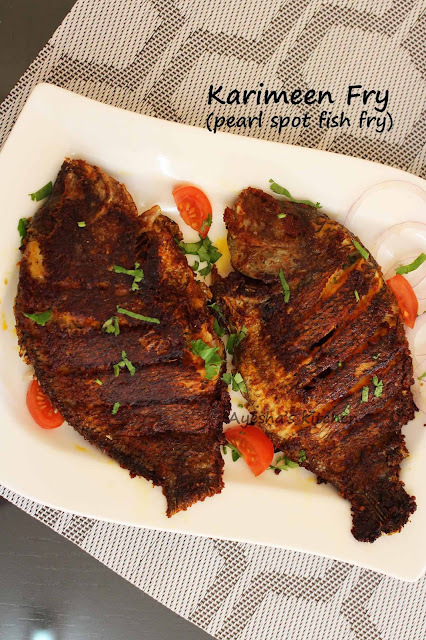 This is a special Kerala style fish fry recipe with the favorite fish of Keralites. 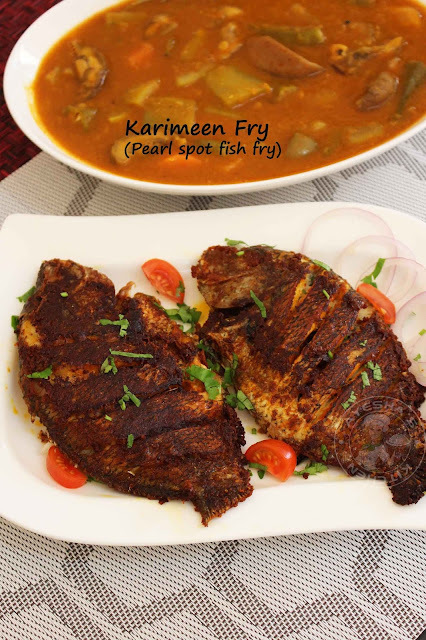 Karimeen fish fry is a spicy fish delicacy which is known for its aromatic flavor. This fish can be grilled in banana leaf, pan fry fish, or cooked in a spicy tangy gravy. For sure, each household has their own variation in preparing a fish fry. 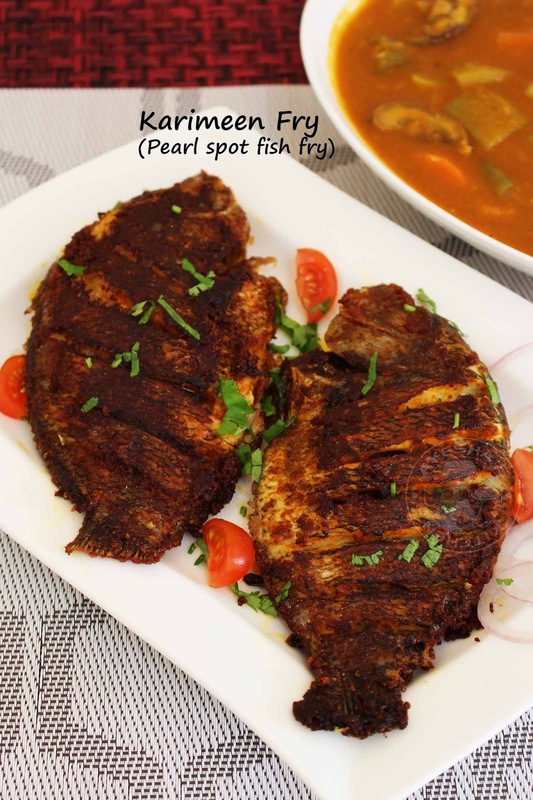 Though the fish fry is very simple and delicious, marination of fish is the vital part in preparing the fish fry. You can choose your favorite fish marinade but each slice must be well marinated before frying. Always use fresh fish for the best result. I always prefer shallow frying as the best way to fry fish. And the best oil for frying fish is coconut oil which gives an aromatic inviting flavor to the dish. Clean and wash the pearl spot fish well with water. (If required you can add a tablespoon of vinegar while washing). Make slits on both sides of the fish. Drain the water and set aside. Grind together all the ingredients given under 'for grinding' along with little water and make a fine smooth paste. Do not add more water. Make a thick paste. (cornflour in this marinade gives the fish a crispy crust, so do not skip it). Marinate the fish with this marinade well and refrigerate it for half an hour. Preferably for 2 hours. Marinate inside the stomach cavity and slits well. Heat oil in a nonstick pan. Add some curry leaves and then shallow fry the marinated fish until crispy and golden over a medium flame. Flip the fish only after one side is done. When done, remove it from oil and serve hot. NOTE. Here I used Kashmiri chili powder which is less hot but gives fine red color. You can use normal red chili powder instead if so, add less for those who do not prefer hot and spicy dish.